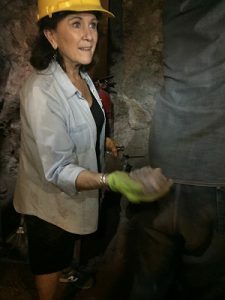 I had been selling Four Peaks Amethyst for 3 years, but never in my wildest dreams did I understand the magic behind the mine! 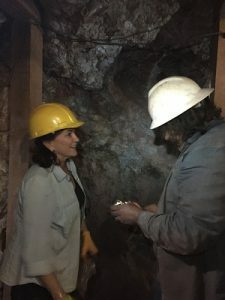 On September 25th of 2015, I was invited to tour the mine by Kurt Cavano, the owner, and was taken on this magical journey by Debbie Antonelli, his sales representative for Four Peaks Amethyst. I was beyond excited, although I had no real idea what I was in for. 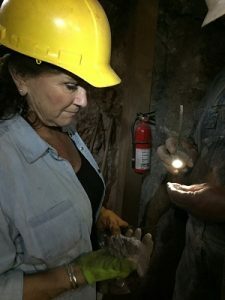 I have traveled extensively throughout the world, seen four of the Seven Wonders of the World – and this experience was, by far, one of the most magical and exciting things I have ever done. We were driven to a remote hideaway out on the Beeline Highway to await our helicopter. It was a very hot day so we all waited under huge shade trees. 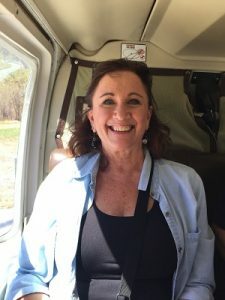 I had never been in a helicopter before, but my fear was surpassed by my excitement, as we were all strapped in to this tiny craft. 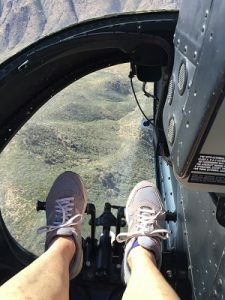 The 25 minute ride up to the mountain was like flying on the wings of a large hawk – you could see everything, especially the Four Peaks Mountains like they are supposed to be seen, so remote and quiet. It looked as if we were going to fly right into the side of the mountain – then suddenly we saw people as we got closer and closer – still not able to see where we were going to land. We literally had to jump out of the helicopter onto a small landing area and then walk up the hill. Being greeted by Kurt at the upper landing was beyond all expectations for me. I had no idea he would be up there! I felt so privileged and special. Kurt told us all about the land, the formation of the mine and about how the Amethyst was formed, as we looked down in awe from 7,000 feet above where we all started our trek. The magic had begun with Kurt’s excitement of this beautiful land. From the upper landing, we hiked up to the entrance of the mine, picking up pieces of amethyst rough along the way…it was everywhere! There was a staging area where each day’s work, all done by hand, gets sorted. We then headed into the mine where Mike Blank, the veteran miner, greeted us and showed us where the mining begins! As we walked in, the whole mine was sparkling!!! The walls were covered in amethyst dust and it looked as if there were amethyst crystals everywhere! We were allowed to look for and mine crystals all on our own. We chipped away at large pieces of rock, hoping to find an amethyst gem! Mike graciously followed behind, helping and pulling out his flashlight to see if what we had found was a quality gemstone. Everything looked like a quality gemstone to me! I found 2 large pieces and carried them out with loving care. I came out covered in purple amethyst dust from head to toe! It was amazing and I loved every minute of it! The views from the mountain are truly spectacular! The whole experience took my breath away…the magic of the Mine was now in my blood! My heart was set…my plan was clear. I emailed Kurt Cavano the minute the helicopter landed. We met for dinner and there was a lot of very animated and excited talking about my ideas for a mining store featuring Four Peaks Amethyst. 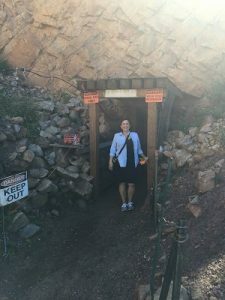 Here we are, 2 years later and we have Four Peaks Mining Co! An outstanding share! I have just forwarded this onto a coworker who was doing a little homework on this. And he in fact bought me dinner due to the fact that I found it for him… lol. So allow me to reword this…. Thank YOU for the meal!! But yeah, thanks for spending the time to talk about this matter here on your internet site. Thanks! We appreciate the shout outs!